The market has been relentlessly creeping higher since I was last interviewed. In this week’s interview with Mike Swanson from WallstreetWindow we take a closer look at the Sector Rotation going on right now. We simply try to find out what is propping up the markets. The best traders are not afraid of holding on to strong stocks, they are afraid of holding on to losing stocks. 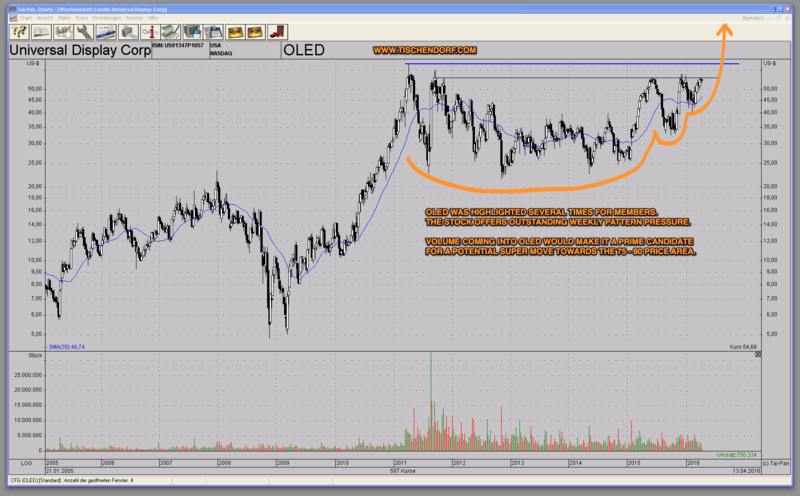 OLED – Universal Display is one stock I am very bullish because of its powerful weekly pattern pressure. But there is another important aspect that makes me bullish. Potential big winning stocks often display that often overlooked characteristic. Listen to the interview and you will know exactly what I am looking for when searching for big winners!